will offer you plenty of escapes! Drats, I am not happy about the weather. I am a southern girl, after all! 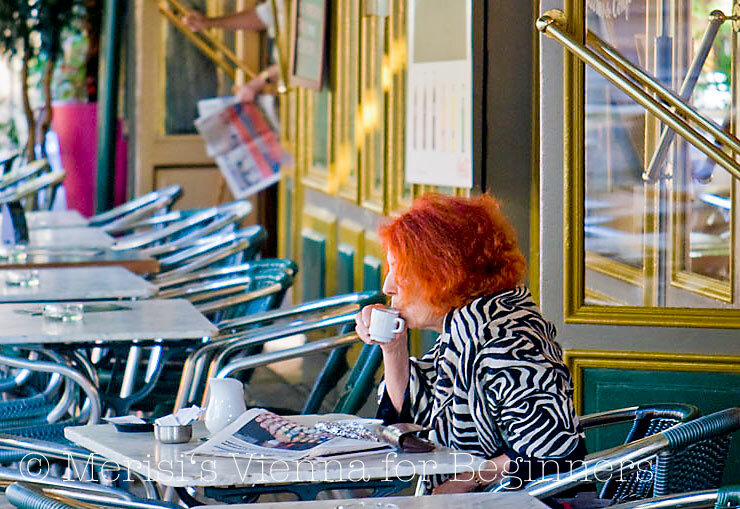 We've been to Les Deux Garçons in Aix and sat, just as that lady is doing, and sipped coffee and people-watched. Hope your weather warms up soon. I think it's been cold in Provence too, oui? South of France sounds almost as lovely as Vienna. 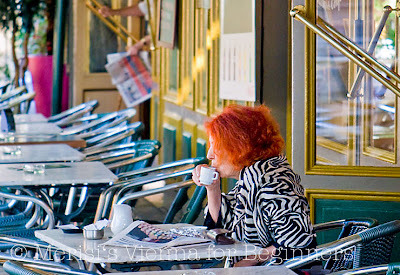 How fun and she does seem to be enjoying her morning coffee!! I know I would be!! Hope your week is going well, Merisi!! Now there's some red hair! Great capture! The colours are fantastic. Colours always seem richer when you photography them. The camera loves your eye.. as do I.
haha Thanks for the momentary escape! Thank you all - each and every comment was light a ray of sunshine!